Avril is doing a cool thing with her fans this Tuesday, September 24! Other than being the album pre-order date, it's the first ever Avril Google+ Hangout at 6 pm PT! More info can be found here. It's YOUR opportunity to be live on screen with Avril and ask her a question! Avril was busy yesterday, arriving, leaving, rehearsing and performing for Jimmy Kimmel Live! show wearing all different outfits (including a camouflage onesie). The performance consisted of Avril arriving sitting on a Jeep, the Bear-Shark, and dancers! The televised performance (of Rock N Roll) airs on Sept 26, but for now watch some fan videos here. 9 DAYS UNTIL AVRIL'S BIRTHDAY! 9 days until Avril's birthday! Give her the best gift and donate to The Avril Lavigne Foundation. Any amount helps, and by doing so you are entered to win a VIP trip to New York City to meet and party with Avril!!!! Supporting a great cause and getting a once in a lifetime experience? YES PLEASE! Avril was FINALLY photographed out today in Los Angeles at Bristol Farms grocery store, sipping on a Starbucks. AVRIL RETWEETED, REPLIED, FAVORITED AND FOLLOWED ME! If you were roaming around Twitter you might have noticed that Avril held a quick contest to show her your 'Rock N Roll" moment... I tweeted a picture with my signed Avril Lavigne Telecaster and she responded (and favorited)! Because I was chosen as one of the winners (of an autographed photo), I also got a follow from Avril!!! Unfortunately, once I sent my address, I was unfollowed. However, I am still soooo excited! “@AvrilLorg: This is my #rocknroll moment! #Avril13million pic.twitter.com/jBnX0SHayo” yessss!! Girls who play guitar definitely rock!! Avril's birthday is 2 weeks (on September 27, if you didn't already know), and in celebration, she is holding a contest with Prizeo and The Avril Lavigne Foundation to win a trip to party with her at the record release party in New York! 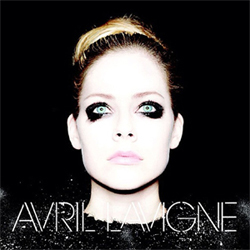 Avril Lavigne's 5th album, "AVRIL LAVIGNE", will be officially released everywhere on November 5th, but some countries might put out the album earlier. Pre-order will start September 24. Don't know how this leaked so early, but here is the studio version of "17", from Avril's 5th album. We have previously heard this song, but in a live version. Sounds great! Things are happening! Billboard OFFICIALLY revealed the tracklisting for Avril's upcoming 5th album, "AVRIL LAVIGNE", available everywhere November 5th. Pre-order will begin on September 24. With titles such as "Bitchin' Summer", "Hello Kitty", and "You Ain't Seen Nothin' Yet", this album screams FUN to me! What do you think of the official tracklisting? Which songs are you most excited to hear? My new favorite shoot! Mark Liddell photographed Avril on July 24 in Los Angeles for a Vanity Fair Italy photo shoot! We can most likely expect a magazine spread coming soon. Avril was in Toronto last night to perform at the Wham Bam festival along side acts like Robin Thicke and Classified. Personally, her outfit, hair and makeup for the pre-show interviews is the best I have seen her look. Just gorgeous! She also performed Rock N Roll for the first time ever! The performance could have had more energy, but her vocals sound great.